Hanwha Q CELLS Co., Ltd. CTO Daniel Jeong remarked: "The performance of our Q.PEAK DUO and Q.PLUS modules demonstrates Hanwha Q CELLS' continued commitment to tackling the toughest challenges in the industry and highlights the importance of focusing our R&D efforts in areas where we can deliver the most added value to our customers." BERLIN, Dec. 6, 2018 /PRNewswire/ -- Hanwha Q CELLS ((collectively referring to Hanwha Q CELLS Co., NASDAQ:HQCL) as well as Hanwha Q CELLS & Advanced Materials Corporation) (or the "Company"), one of the largest solar cell and module manufacturers in the world, today confirmed that its leading range of solar modules have delivered exceptional performance in a recent test conducted by Fraunhofer Center for Silicon Photovoltaics (CSP) to benchmark light and elevated temperature induced degradation (LeTID) in solar cells. Hanwha Q CELLS' modules were tested by Germany's Fraunhofer CSP and found to display negligible power loss during high-temperature testing conditions of up to 75 degrees Celsius. Both Hanwha Q CELLS' half-cell monocrystalline Q.PEAK DUO modules and multicrystalline Q.PLUS modules exhibited market-leading anti-LeTID performances among the nine module types tested (comprising seven mono-Si and two multicrystalline silicon modules), including modules produced by various leading solar brands. The final test batch included two modules from each category, resulting in 18 different measurements. The results of this test were presented at the EU PVSEC conference in September titled: Benchmarking Light and Elevated Temperature Induced Degradation (LETID). The effects of light induced degradation (LID) on PERC (passivated emitter rear cells) solar technology are well-known in the PV industry, and are tested for during standard IEC certification of solar cells. However, LeTID -- which is a degradation effect identified on both monocrystalline silicon (Cz-Si) and multicrystalline silicon (mc-Si) cells at temperatures above 50 degrees Celsius -- can account for cell degradation of up to 10%, but is less understood across the industry. Hanwha Q CELLS was the first solar cell developer in the industry to link the degradation of PERC cells to high temperatures and was thus the first company to devise a solution to suppress LeTID in 2015, using its Q.ANTUM cell technology that suppresses LID as well as LeTID. While the exact root cause of LeTID is still a topic of much debate among photovoltaic researchers, Hanwha Q CELLS' Yield Security pledge guarantees that the Company's mono and multi Q.ANTUM products are certified anti-LeTID -- a claim that few other manufacturers can make. By controlling for both LID and LeTID, Hanwha Q CELLS can guarantee a reliable module power for the lifetime of its modules. The Fraunhofer CSP results further demonstrate the reliability and durability that the Company's Q.PEAK DUO (Cz-Si) and Q.PLUS (mc-Si) solar modules deliver, with both module types exhibiting <1% power loss during Fraunhofer CSP's stringent testing procedure. 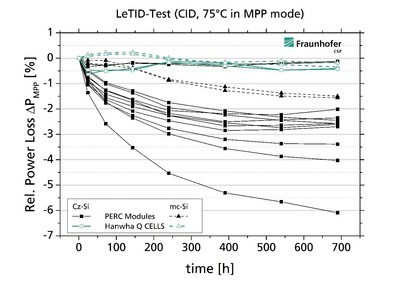 As showcased in the graph from Fraunhofer CSP, Hanwha Q CELLS' monocrystalline (Cz-Si) and multicrystalline (mc-Si) solar modules performed favorably when exposed to accelerated LeTID test conditions (CID -- current-induced degradation at 75°C and operation in maximum power point (MPP) mode) compared to other solar module brands tested. Commenting on the Fraunhofer CSP test results, Hanwha Q CELLS Co., Ltd. CTO Daniel Jeong said: "The performance of our Q.PEAK DUO and Q.PLUS modules demonstrates Hanwha Q CELLS' continued commitment to tackling the toughest challenges in the industry and highlights the importance of focusing our R&D efforts in areas where we can deliver the most added value to our customers." "Hanwha Q CELLS is proud to be at the forefront of anti-LeTID technology and will continue to shape and support the solar industry by developing new photovoltaic technologies and tackling head-on the technical hurdles that arise. We do this to ensure that our products are the go-to option for discerning developers who want to install quality that lasts and performs reliably, regardless of the conditions," said Jeong. Fraunhofer CSP's LeTID paper was presented at the 35th EU PVSEC Conference and Exhibition held in Brussels, Belgium, between September 24-28 this year. This attached graph is an updated chart that highlights the results for Hanwha Q CELLS' modules. This press release contains forward-looking statements. These statements constitute "forward-looking" statements within the meaning of Section 27A of the Securities Act of 1933, as amended, and Section 21E of the Securities Exchange Act of 1934, as amended, and as defined in the U.S. Private Securities Litigation Reform Act of 1995. These forward-looking statements can be identified by terminology such as "will," "expects," "anticipates," "future," "intends," "plans," "believes," "estimates" and similar statements. Among other things, the quotations from management in this press release and the Hanwha Q CELLS' operations and business outlook, contain forward-looking statements. Such statements involve certain risks and uncertainties that could cause actual results to differ materially from those expressed in or suggested by the forward-looking statements. Further information regarding these and other risks is included in Hanwha Q CELLS filings with the U.S. Securities and Exchange Commission, including its annual report on Form 20-F. Except as required by law, Hanwha Q CELLS does not undertake any obligation to update or revise any forward-looking statements, whether as a result of new information, future events or otherwise.